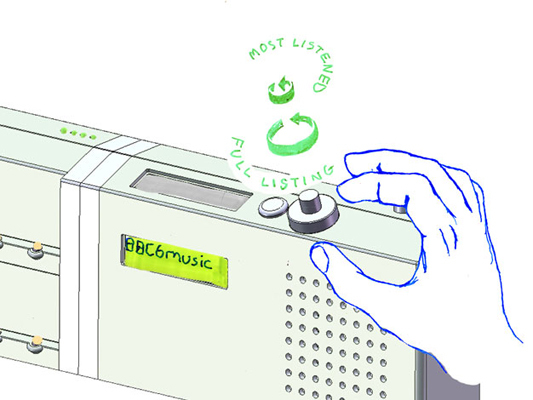 A while back, in 2007, I wrote about ‘a lost future’ of touch technology, and the rise of a world full of mobile glowing attention-wells. It does look very much like we’re living in that world now – where our focus is elsewhere than our immediate surroundings – mainly residing through our fingers, in our tiny, beautiful screens. Like a lot of things here, they are deeply connected to other places. Their attention is divided. And, by extension, so is ours. While this feeling is common to all cities over time, cell phones bring the tangible immediacy of the faraway to the street. Helped along by media and the global logistics networks that define our material lives, our moment-to-moment experience of the local has become increasingly global. Recently, of course, our glowing attention wells have become larger. We’ve been designing, developing, using and living with iPads in the studio for a while now, and undoubtedly they are fine products despite their drawbacks – but it wasn’t until our friend Tom Coates introduced me to a game called Marble Mixer that I thought they were anything other than the inevitable scaling of an internet-connected screen, and the much-mooted emergence of a tablet form-factor. It led me to think they might be much more disruptive as magic tables than magic windows. Marble Mixer is a simple game, well-executed. Where it sings is when you invite friends to play with you. Each of you occupy a corner of the device, and attempts to flick marbles into the goal-mouth against the clock – dislodging the other’s marbles. Beautiful. Simple. But also – amazing and transformative! We’re all playing with a magic surface! When we’re not concentrating on our marbles, we’re looking each other in the eye – chuckling, tutting and cursing our aim – and each other. There’s no screen between us, there’s a magic table making us laugh. 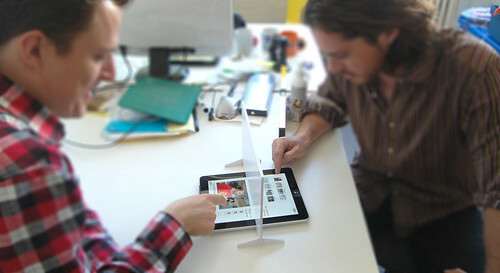 It’s probably my favourite app to show off the iPad – including the ones we’ve designed! 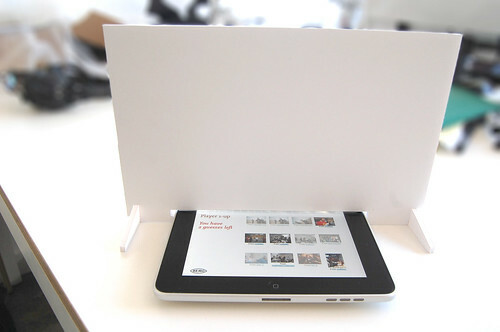 It shows that the iPad can be a media surface to share, rather than a proscenium to consume through alone. 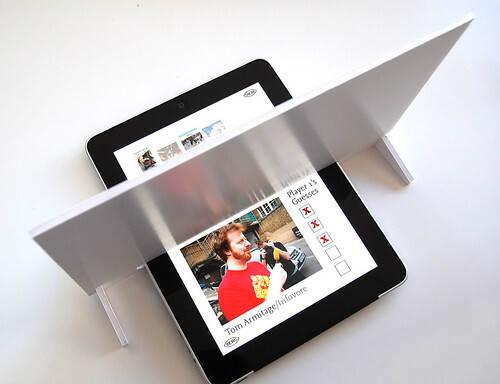 [GoGos]’d be the perfect counters for a board game that uses the iPad as the board. They’d look gorgeous sitting on there. We’d need to work out how to make the iPad think they were fingers – maybe some sort of electrostatic sausage skin – and to remember which was which. Anyway – as you can see – this is not so serious a prototype, but I can imagine some form of capactive treatment to the bottom edge of the screen, perhaps varying the amount of secret territory each player revealed to each other, or capacitive counters as Russell suggests. Aside from games though – the pattern of a portable shared media surface is surely worth pursuing. This post is going to be about objects that celebrate their functions. This was an area of research for me during my time at the Royal College of Art. I’m going to follow on from Matt’s post on Disco and intrinsic activities. More show than tell here I think. Here is my favourite piece of video right now. It is from the film 9 and a Half Weeks (via James Auger), and if you can wade your way through Rourke and Basinger power bonking their way around Manhattan you see this tape deck in his apartment. I’ve looped the video a couple of times and slowed it so you can see clearly. I’m pretty sure it is a Nakamich RX tape deck. Using a system called UDAR (UniDirectional Auto Reverse) it mechanically flips the tape over at the end of each side. Something to do with aligning the heads. It is a fantastic piece of perfomance, and completely intrinsic to the nature and qualities of tape decks. Whatever it’s functional relevance might be, witnessing a mechanical operation so performative is excellent, the object is so discreetly joyful about what it is doing. I also came across this video of a Red Raven records vinyl (via Alex Jarvis) on Kempa.com, along with some lovely research on vinyl video. It has two components. One is the vinyl, which has a large area of printed imagery on the larger than normal label; the second is a sixteen sided mirror which sits in the middle of your turn table and works like a zoetrope, reflecting the images on the vinyl as it turns and creating animation. This a is beautiful response to the intrinsic qualities of vinyl and the mechanism of the record deck. More products should include this sort of wit and performative funtionality.